The beginning of this present opera of Gianmaria Ferrante contains the three figures that are a key to the collection, those of the man and sand, the hawk and the battlefield, and the mirage. These seem to anticipate, in an order that is not immediately noticeable but which can be easily deduced, the three sections of the collection, Ten Messengers, Nothing Remains and Three Coins. The volume moves from the universal to the particular, at the beginning drawing large frescoes in which history and space fuse in a convergence of unavoidable destinies and the concentrate the vision on more focussed images, finishing on remnants of individual influences, fragmented and minimal like the applause that sounds when the stage is empty. The emblem of history shows itself clearly from the first lyric: a history that goes beyond time, becomes time itself enclosing the thoughts of a man and a whole series of peoples, leaving in a waiting suspension the effects of a brief solemn pause made of indelible marks, shadows and hallucinations brought about by the summer sun or the Scirocco wind on the surface of the stones. Only a poet could give a sense – if ‘sense’ is the correct word – to this deep, visceral warning, so mysterious as to pass over the centuries and grind together the past and present, mixing temporal contradictions and oppositions to create a single flow. 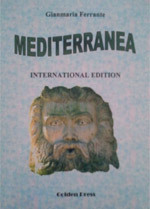 The Mediterranean, the real protagonist of the work, seems to be the firm landing place for the tie-ropes of history, in a journey that sometimes seems to be orientated from north to south, given the recurrent reference to the figure of the ‘Swabian’ emperor in particular, but also the more veiled ones to Alexander the Great. An ancient civilization re-flows powerfully from the images created, and it is everywhere the history of the Mediterranean, an interior awareness of an absolute time, that in the fixed images (flickering in the sun in a sort of eternal summer), runs through the movements of the gods and heroes of Magna Graecia which may be real and tactile or symbolic, metaphoric and metamorphic. There is the flattering threat, however, of a return, solemn and definitive more than cyclic, of history, as if in the landscape there might remain impressed the images of warriors ready to come to life, taking up their forms and movement, their arms and cruelty, with the aim of tracing once again the universal lines of destiny among silences and hubbub, in the clash of swords and the clink of steel. And so a long series of ‘last’ apparitions, dream materializations ready to pounce, with the fear of the appearance of the last warriors, the last soldiers, the dark knights accompanied with bonfires and drums, columns and ruins, all under the weight of a sort of cadenced signal of thunder which, almost at regular intervals, comes to mark the passages, the opening and closure of some of the lyrics and certain phrases moving between creating a vista and an epiphany. The imaginative texture of the landscape is dotted with precise references positioned with surprising attention to symmetry; for a certain number of segments of the collection each lyric possesses a spirit which is called, variously, Pollini, Aspromonte, Sila, Salento, the Murge, Gargano, Syracuse, Taranto, Ostuni, Sibaris, and there are passages about the Adriatic, Jonio and the Aegean, Mesopotamia, Libya and Lebanon, all closing in the ideal of Dalmatia and Montenegro. It is poetry that grasps the deepest and most mysterious aspects that no guide or indications in a brochure will ever be able to provide for the ‘tourist’: the restitution of the deep images and sounds of the past, not to re-live them but to let what is and always will be ‘live’, regardless of the fragmentary state in which it appears. The references to the tourist, machines, to steel and the present constitute in a flash a stylized reference to the prosaic common shame that shrieks out in some lyrics and establishes a strong border to the existential dimension; there is for instance the confrontation between the solemnity of the heroic atmosphere that emerges from the past and the ignominy of the “last person held in a hole” on the mountains of Calabria. Or, in They Moan, where the present that is near and far away at the same time, always ‘Mediterranean’ but nevertheless universally historical, terrible, warring, savage and immense, seems to be described in detail. The attention Ferrante gives to metre and rhythm is in perfect harmony with the lofty nature of the themes he treats and the great attention, at times almost obsessive, given to the lexical choices which the poet expertly uses for the monochordal movement forward and the exquisite interior musicality of his poetry: the words run after each other, attract each other and vibrate in sympathy and for that they hit the right note perfectly, above all in the extreme measure of the choices referring to burdens, never too much and never used as a mere supportive device or in passing. They are all normal words with normally accepted meanings, and they run full-bodied and agile in the vertical growth of the verses like the rings of a charm bracelet, unequal but in an alliance, alliterative and synaesthetic. The carousel of the phonic recalls increases the expressive tension everywhere and colours the contents with an expressive power able to renew itself in a uniformity cadenced by a six and seven and a half feet metre. In verse after verse and in the couplets prevalent in the conclusions of each lyrical section, pleasing but also powerful, strident, clipped verses appear. These are an advantage for a graphic and subtle flow which at the same time gives a width of vision that envelopes the reader.